After weeks of build-up, Guilds of Ravnica is finally here. I've spent the last several weeks discussing the set's potential impact in Standard, and I'll be following the development of the new Standard metagame quite closely over the next few weeks as we get closer to Pro Tour Guilds of Ravnica. However, with the next SCG Tour® stop in Columbus fast approaching, it's time to shift gears and look at the set's potential impact in Modern, since that's the format I'll be playing, this time alongside Todd Anderson and Jim Davis. In an ideal world, I'd be enamored with Humans and already locked in, but that's far from reality. Outside of my PTQ win in Richmond, my results with Humans have been rather poor, including a miraculous run at the Team Constructed Open in Dallas where I had to be carried to the finals. After a poor string of results with a deck, it becomes harder to chalk it up to bad variance, and indeed in the tournaments I played, it didn't seem as though my draws were anything but average. If there was a deviation, it was in the PTQ, where my draws were excellent. It seems as though the Modern metagame has adapted to Humans, and while it experienced a brief resurgence due to the hype around Militia Bugler, it has once again fallen back into the pack and become just another face in the crowd. It's mostly a typical Modern Dredge list, but Creeping Chill, a mostly overlooked card from Guilds of Ravnica, is there as another payoff for committing to the dredge mechanic, giving the deck an added bit of aggression and/or reach. I was naturally skeptical, especially given how unreliable MTGO League data is these days. A single unique deck is guaranteed to get published, and there's no way to know whether it's an aberration or something promising. In another moment of good fortune, two more copies of Dredge, both featuring a full playset of Creeping Chill, made the top 8 of the Modern Challenge. At that point my interest was fully piqued. Dredge is a deck I'm very familiar with in Modern, having taken it to three Open top 8s, including a win, in various iterations including Bridge from Below, with and without Cathartic Reunion, and pre and post the reban of Golgari Grave-Troll. Despite its reputation, the Modern iterations of the deck were quite intricate and interactive, winning long attrition games with Life from the Loam and Conflagrate just as often as it would run the opponent over with a horde of early creatures. Immediately I thought back to the last time I played the deck, the first Open of this year in Columbus. A promising 9-1 start was derailed by a four-match losing streak before I meekly drew in the last round to secure a top 64 finish. It was a fine finish, and I made my share of mistakes during the losing streak, but the major takeaway for me was in how much of a struggle each match was. Simply put, the rest of the Modern format had caught up with Dredge in raw power. What the deck was doing wasn't trumping the rest of the field often enough to compensate for its vulnerability to common sideboard cards. As a linear deck, Dredge is supposed to generate a significant number of free wins. 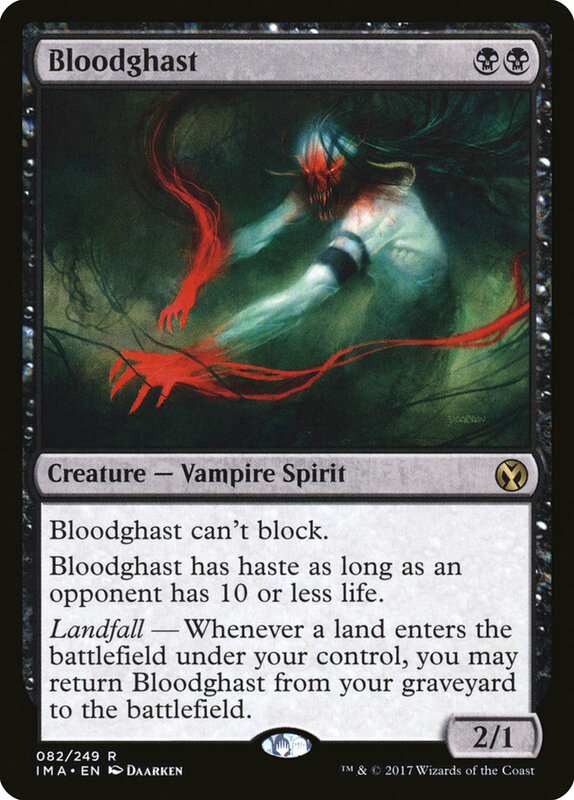 Whether it's a straight race or the power of Life from the Loam + Conflagrate, it should overpower the other deck, especially in game 1s when there is little chance of graveyard hate. But I was scraping by to win most games, even with no hate in sight. And though Dredge is resilient enough to beat hate cards a good portion of the time, you don't want to rely on beating it consistently because you're losing so many fair games. This was mainly due to the ban of Golgari Grave-Troll stripping the deck of some its explosiveness, but Dredge had been a significant player over the previous year even without the most powerful dredger, so what else changed? The format got faster. Grave-Troll went at the same time as Gitaxian Probe , which hurt combo decks, while the introduction of Fatal Push helped fair decks quite a bit. The other top decks in the format that year were Grixis Death's Shadow, a heavy-disruption deck that Dredge preys on, and Eldrazi Tron, a weak matchup but only because Todd Stevens insisted on playing eight million pieces of graveyard hate. Still, Eldrazi Tron's maindeck Chalice of the Voids helped suppress combo decks and slow the format down, which is exactly what Dredge needed. As the metagame evolved, players learned how to get under those decks. Storm gained Baral, Chief of Compliance and Humans emerged that fall, both of which are able to go toe to toe with Dredge without graveyard hate. The format sped up a bit in response, and Dredge was left behind and largely supplanted by Hollow One, which had similarly explosive starts in a more resilient package. Over the last two years, Dredge received essentially no new tools to help it adapt. But that has changed with Creeping Chill. A free Drain Life for three may not look like much, but after thinking about it, I believe it could be enough to put Dredge back near the top of the Modern hierarchy. For the most part Dredge does its damage on the first three turns of the game. Those are the turns where you're tearing through your deck and amassing a large battlefield of creatures. 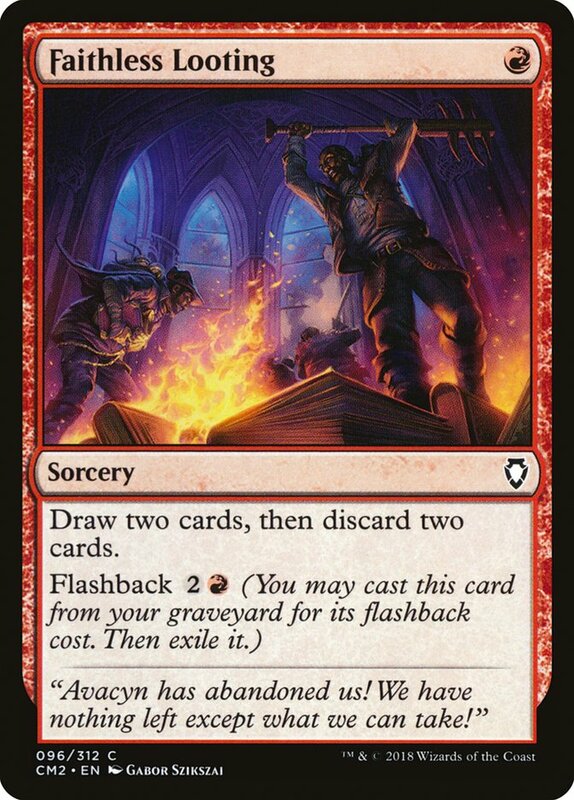 But from there, it often takes at least two turns to close the game, and that lag between the execution of your "combo" and the actual close of the game is enough of a window for Modern decks to either race or find enough interaction to get back to parity. Creeping Chill goes a surprisingly long way toward closing that window. First, the damage it represents could end the game by itself, especially if you mill over multiple copies. Failing that, it makes closing the game with a lethal Conflagrate a lot easier. With an extra three to six damage along the way, the pattern of T1 Enabler-T2 Enabler-T3 Flashback Faithless Looting-T4 Dredge Loam + Flashback Conflagrate is going to end a lot games rather than coming up just short. 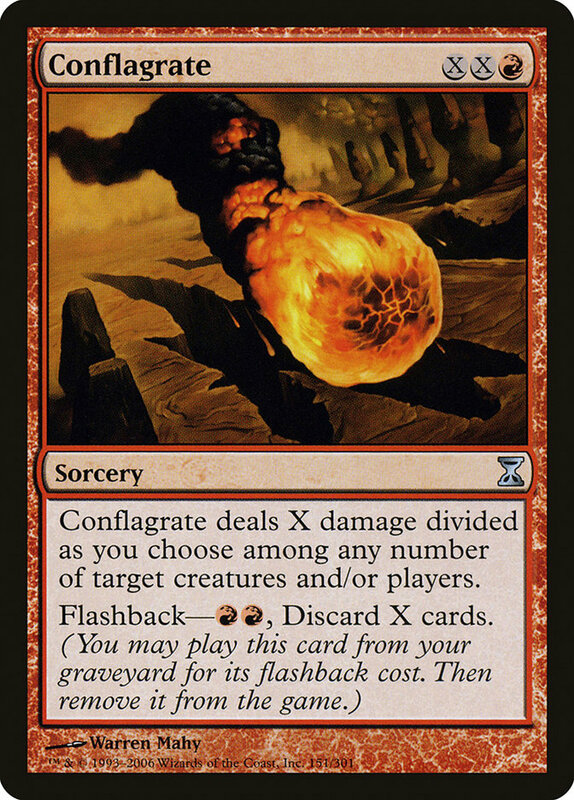 And lastly, that extra damage early helps get the opponent to the magic life total of ten to give Bloodghast haste. At its height with Golgari Grave-Troll, Dredge was consistently killing on turn 4, with the occasional turn 3 kill on a great draw. After the ban, that clock was pushed back at least half a turn, where a good draw produced a turn 4 kill and a mediocre draw killed on turn 5. Creeping Chill pushes the deck back towards a consistent four-turn clock, and that's enough to push it back toward prominence, even in a relatively fast Modern metagame. The lifegain from Creeping Chill is also important in a variety of matchups. Burn, which has picked up recently, is the obvious matchup that improves, but it will be important against Humans, too. In that matchup, the Humans deck is spending its early turns playing defense, trying to establish a large enough battlefield to lock up the ground while using Meddling Mage to stop Conflagrate. At that point, Mantis Rider takes to the air to end the game before the Dredge player can break the stalemate on the ground by going wide enough or unlocking their Conflagrates with other removal. 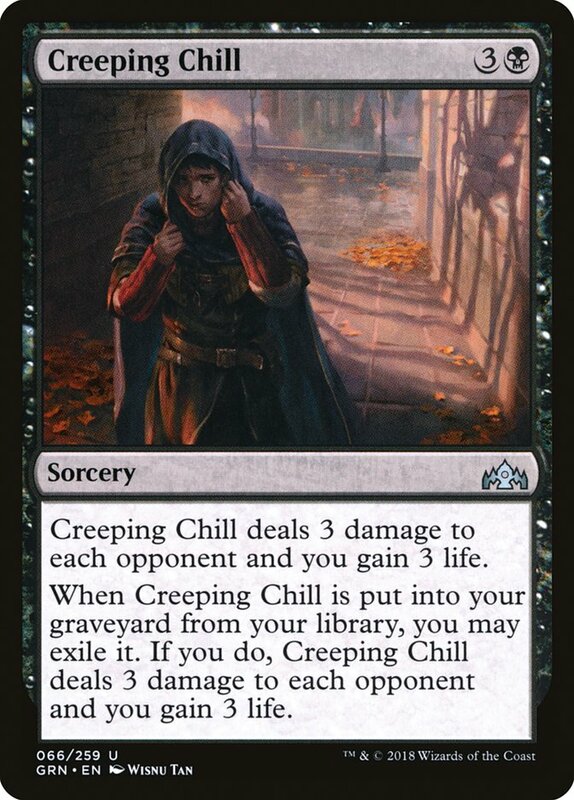 Creeping Chill not only provides extra reach in this scenario if they stabilize at a low life total, but the lifegain makes turning the corner harder, giving the Dredge player more time to close the game via other means. This same dynamic guides other aggro matchups, notably Bant Spirits, so it's making the deck better against a wide swath of the format. But Guilds of Ravnica isn't stopping with Creeping Chill. The most hyped card of the set, Assassin's Trophy, is also a significant gain for Dredge. 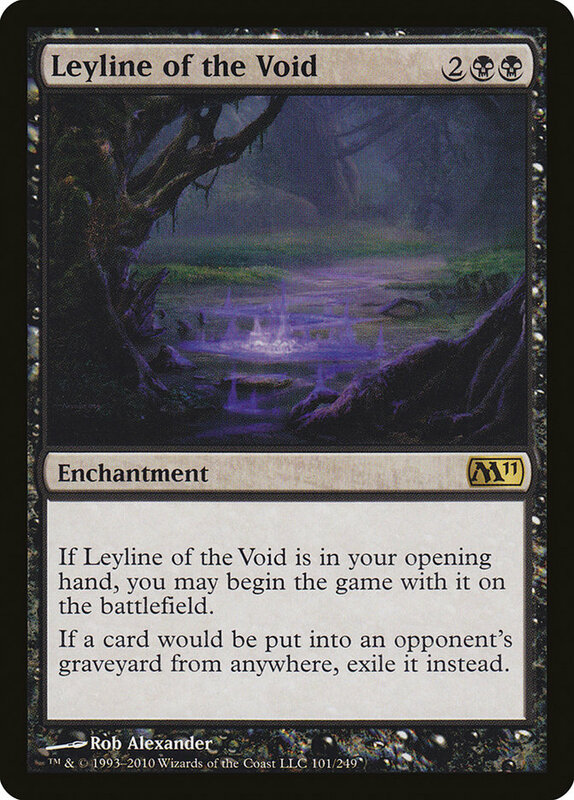 Abrupt Decay has been a common sideboard card in Dredge because of its versatility in answering anything from Grafdigger's Cage to Rest in Peace to Scavenging Ooze, but it had a major hole in Leyline of the Void, which has picked up in popularity since the emergence of Rakdos Vengevine. Assassin's Trophy fills that hole nicely alongside Ancient Grudge, and Nature's Claim gives you a varied suite of answers to the common graveyard hate cards in Modern. More importantly, Assassin's Trophy will, if even briefly, push the format toward more fair decks. The return of Jund and other disruption-heavy midrange decks is getting a lot of talk right now since they have the most broad answer to a permanent ever. I'm not as high as others on the resurgence of Jund, but that doesn't mean the deck won't see more play. Jund and its ilk are historically among Dredge's best matchups. It's tough to cut away from the primary components of the engine: enablers, dredgers, and payoffs, so trimming a Conflagrate is tempting, especially since Creeping Chill makes the reach less necessary, but Conflagrate is so much more than that in this deck. It's your best card in every aggressive matchup, often playing as a heavily-discounted Plague Wind and more generally, is the best way to empty your hand and keep the engine going after you pick up your early dredgers. 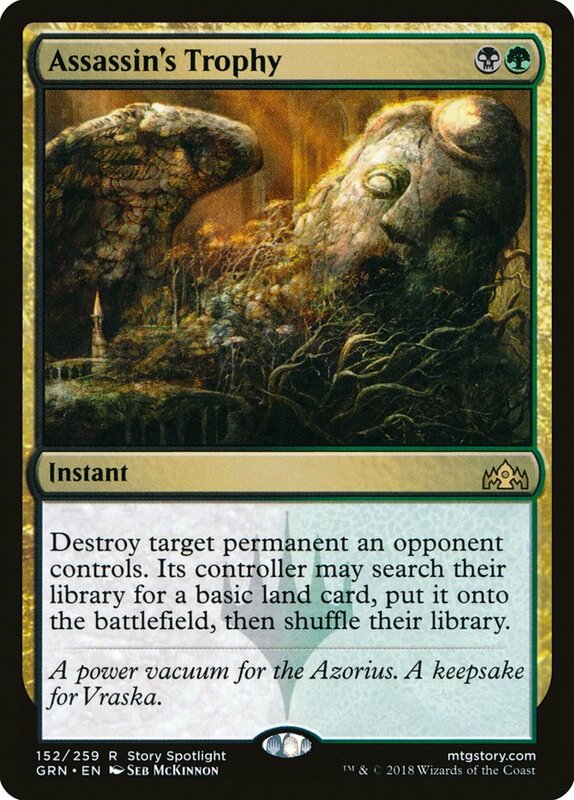 That discarding effect is critical is so many games that I always want to hit one early in game one and only trim a single copy in sideboarding against slower, non-creature decks like Azorius Control and Mono-Green Tron. I added a Dakmor Salvage to bring the count to eleven, but even that number scares me. Not only do you really want to see one in your opening hand, but you often want to chain into them so having a high density is important. I may end up trimming a Creeping Chill to make room for another Golgari Thug or Darkblast but for testing this week I want to have the maximum number to put it through its paces. 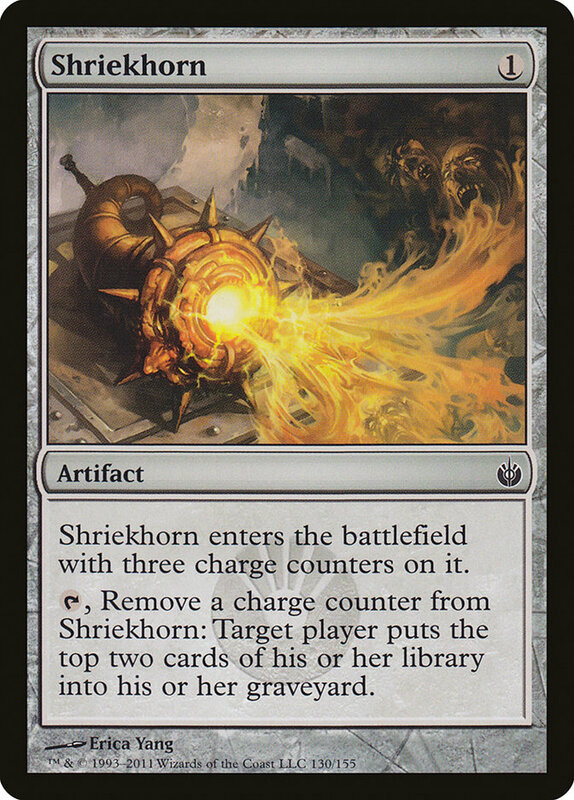 I played Neonate during my last time with the deck, and since then Shriekhorn has become the more popular third enabler. Without Golgari Grave-Troll, Neonate is only milling over three to five cards, making Shriekhorn, which mills four by your next draw step and six overall, the better card. You miss out on some damage on occasion, especially in games where you play through hate, but the more consistent milling is the more important variable here. This is the other place I'm concerned, since you really want to have two lands early to enable Life from the Loam, and the expectation with nineteen lands is to see just about two in your opening hand, leaving little room for negative variance and making mulligans riskier. 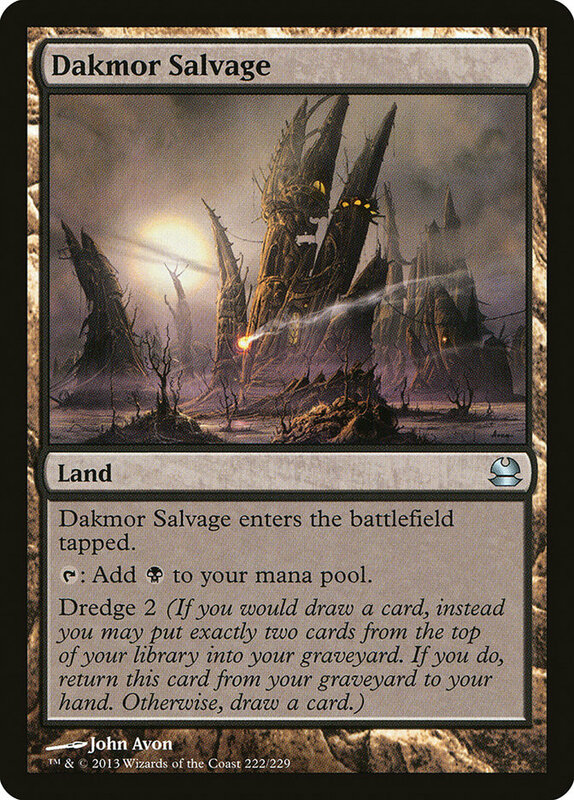 Faithless Looting mitigates this to an extent by helping you see extra cards past your opener, as does the singleton Dakmor Salvage by giving you another path to a second land drop, but fitting Creeping Chill into the deck means the margins elsewhere are razor thin. 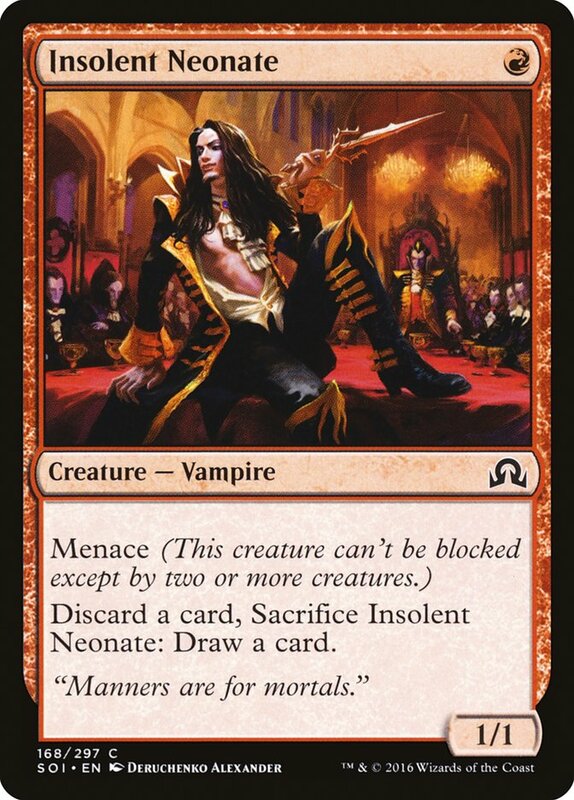 I added this so the sideboard, not only as a way to preemptively prepare for the mirror, but to stymie the more explosive graveyard decks: Rakdos Vengevine and Storm. Both decks can go over the top of what Dredge is doing and don't care much for the resilient long game of Life from the Loam and Conflagrate so having quality disruption for them is a must. With Assassin's Trophy covering a lot of bases, you can trim on the total number of answers to hate and the fact that it also answers creatures made me more comfortable in trimming a Lightning Axe. 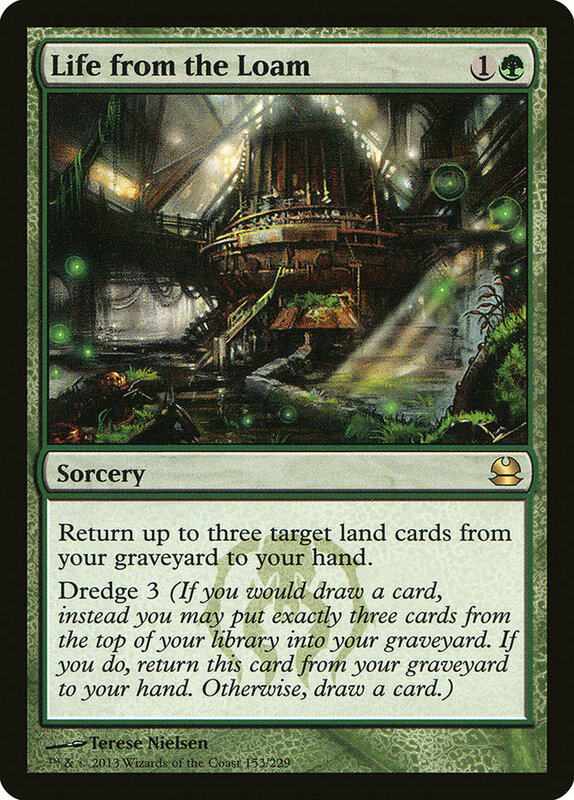 There isn't a lot of wiggle room when building a Dredge deck since the engine takes up so much room, but Creeping Chill is a major upgrade on the other flex spots like Scourge Devil, Haunted Dead, and Driven. 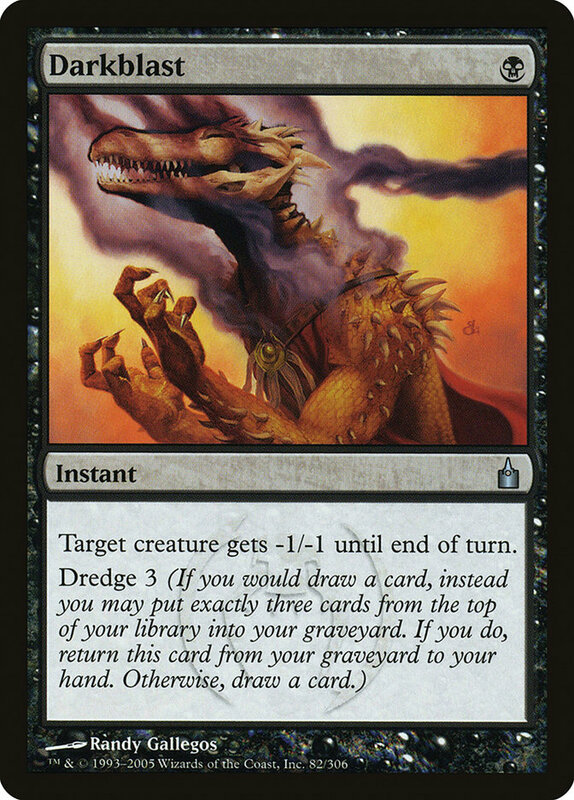 Getting free value in the course of dredging makes it easier to overwhelm the opponent with a critical mass of aggressive effects, from returning creatures to direct damage, to a critical Conflagrate for a blocker or two. Narcomoeba doesn't look like much, but coming along for free has elevated it to multi-format Dredge staple and combo enabler. If Creeping Chill is anything close to that, it'll be a welcome addition to the deck. I'm very happy to see Kaladesh Block leave Standard, and Guilds of Ravnica looks to be injecting a ton of sweet new cards and strategies into that format, but if it lets me Dredge people again, I would be absolutely ecstatic. My birthday isn't for a couple months, but I'll take the early present from Wizards of the Coast.